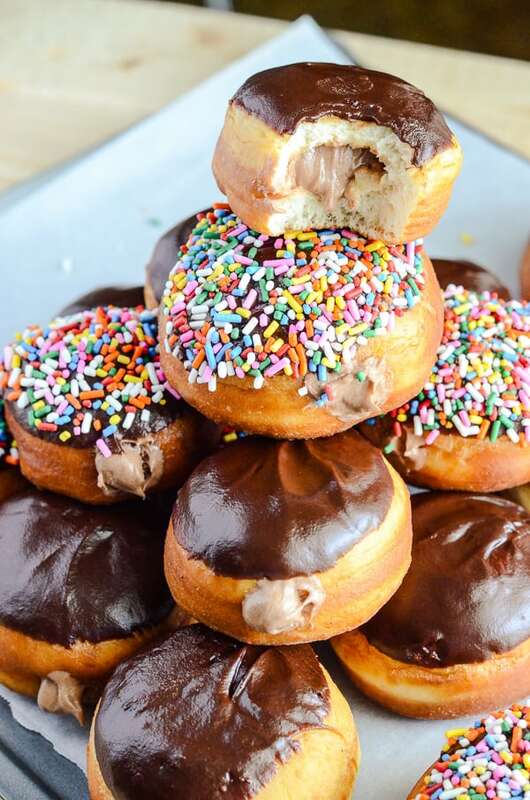 Easy, fried yeast donuts made from scratch, made irresistible by a Nutella cheesecake filling and smooth chocolate ganache topping. Don’t forget the sprinkles! I’ve never met a donut (or is it doughnut?) I didn’t like. Honest! The fluffy, deep-fried, happy flavor of these sinful breakfast treats has always been a favorite of mine. Krispy Kreme, Dunkin’, Entemanns; I can name drop all day, but each brand has a piece of my sweet-loving heart. One thing I committed myself to when starting this blog was making things from scratch that I’ve never attempted before, and these totally fall in to that category. I found a donut recipe in Nana’s cookbook and, after fiddling with it a little, these Nutella Cheesecake Donuts came to life in my kitchen! And I was floored by how easy they were! I’m holding on tight for the weekend. The last two weeks at work have been a whirlwind of busy days; if I’m not cranking out cake orders or racks of bread, I’m trying to organize my office (my office – still so weird to say) and get my department in order. It’s been mostly chaotic, which is why this weekend needs to hurry up and get here. It’s dual birthday celebration time with Mr. Crumby and Princess Gretchen! Saturday will be spent at our haunt – Disney World! It’s our last weekend before block-out dates begin for the summer, so we’re gonna live it up all day (and drive Mr. Crumby crazy!) We scored reservations at Be Our Guest for breakfast and will be hitting all the birthday girl’s fave Magic Kingdom rides; then, a quick stop at Hollywood Studios & Star Wars Weekends, and rounding out the day with dinner and the world’s best margaritas at Epcot before heading home. Friday, however, is a girl’s day out, complete with donuts & iced coffees, pedicures, shopping, and our first concert of the year: Dashboard Confessional and Third Eye Blind at the House of Blues! Talk about a blast from our past. To be completely honest, I didn’t even know either band was still together, much less touring. But excitement! 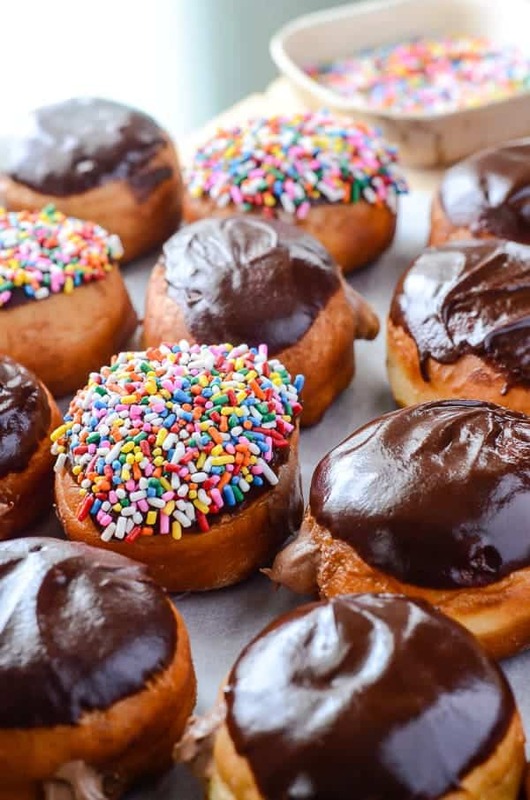 Friday is also National Doughnut Day, and it felt right to celebrate it by not only making homemade donuts, but creating a flavor I’ve never heard of before. And Nutella. I mean, come on. Both of our local chain donut shops have a cheesecake donut of some sort, but neither of them had the common decency to add my favorite gooey chocolate hazelnut spread. And copious amounts of sprinkles. They make everything so much more festive! Making these also gave me the opportunity to try out the brand spanking new deep fryer Mr. Crumby and I recently picked up. After years of splashing oil all over our stove and ruining sauté pans frying up empanadas and battered fish, we finally have a proper deep fryer! Let me tell you, it made frying these heavenly little dough balls a breeze! Absolutely. Effortless. As with any first attempt at a new recipe, I was anxious that I’d somehow messed up and missed an ingredient or tweaked a ratio too much. I’m sure you can imagine my delight as I watched my first batch puff up and brown in the hot oil – I straight up giggled like a moron. Of course, as soon as one was cool enough, I ripped it apart to find the center perfectly doughy and fluffy! My first ever batch of donuts was shaping up to be a success! And perfect for filling with the best Nutella cheesecake dip I know how to make. After toying with the idea of topping it with Nutella too, I decided on an easy dark chocolate ganache instead, to offset the sweetness of the filling a bit. I wouldn’t judge you if you tossed some more of the hazelnut stuff in the icing, though. You can never have too much of a good thing. In the bowl of a stand mixer (fitted with a paddle attachment) or a large bowl, dissolve yeast in warm water. In a small bowl, combine milk with vinegar and whisk; let both sit for 5 minutes. Add milk-vinegar mixture, melted butter, egg, sugar, baking powder, salt, nutmeg, and 1 1/2 cups of flour. Mix well. Add flour 1/2 cup at a time, mixing between each addition, until a soft dough consistency is reached. Fit the mixer with the dough hook attachment and mix for about 5 minutes (or knead on a floured surface) until a smooth dough is achieved. Set dough on a floured surface and roll to 1/2-inch thickness. Cut rounds with a cookie/biscuit cutter, jar, or glass mouth; Set on a lightly floured baking sheet. Re-roll remaining dough and continue cutting until none is left. Cover dough with a tea towel or plastic wrap for 45-60 minutes, allowing them to rise to double their size. Heat deep fryer to 375 degrees F, or 2-3 inches of oil in a dutch oven. Working in batches of 4, fry donuts for 2 minutes until lightly golden brown, turning once halfway through. Combine butter, cream cheese, and Nutella in a medium bowl, and beat with a hand mixer until smooth. Add sugar and salt, beating again until fluffy. Spoon filling in to a pastry bag. Using a chopstick, poke a hole in the side of each donut, about 3/4 of the way through, and twist it a bit to hollow out the center slightly. Insert pastry bag and squeeze gently, filling each donut until it pushes the bag out and oozes slightly out of the hole. Place chopped chocolate in a medium, microwave safe bowl. Pour hot melted butter and brewed coffee over the chocolate, stirring until melted and smooth. Microwave in 10 second bursts if it needs a little help melting. Stir in corn syrup for shine. Dip your donuts in this delicious stuff, and then lick the bowl clean! 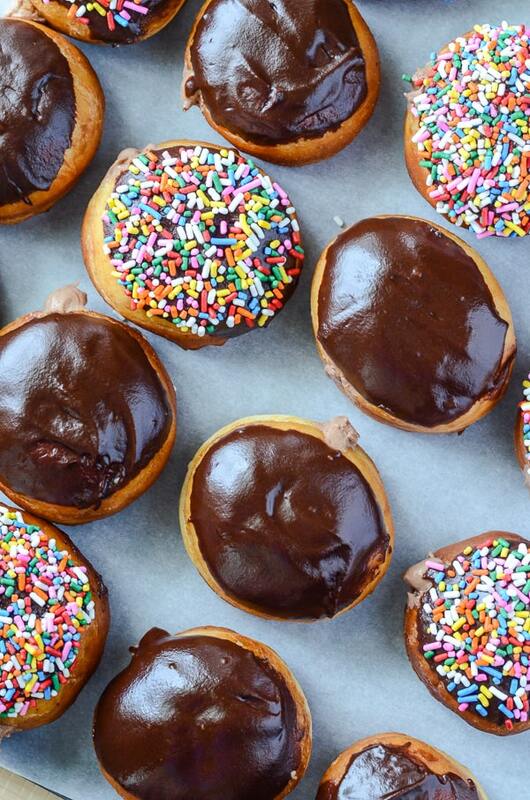 Garnish donuts with sprinkles if desired, serve & enjoy! 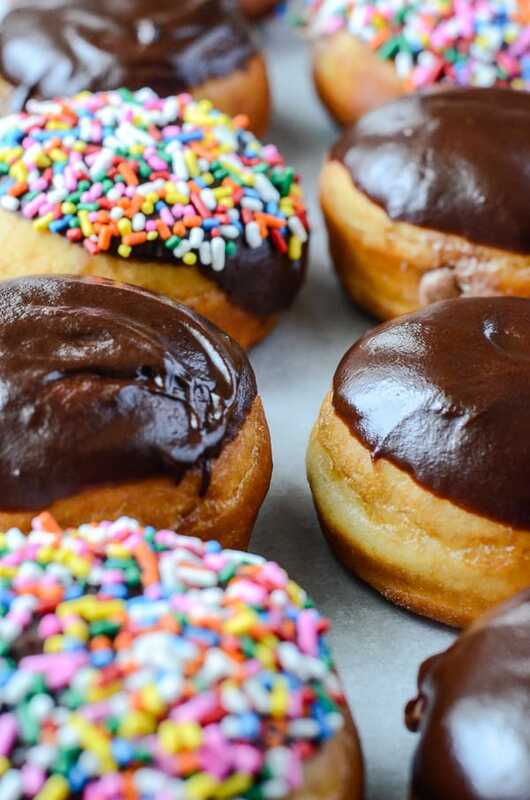 What’s your all-time favorite donut flavor? For even more donuts, muffins, and pancake inspirations, check out my Breakfast Bonanza Pinterest board! I’ll take a batch please! 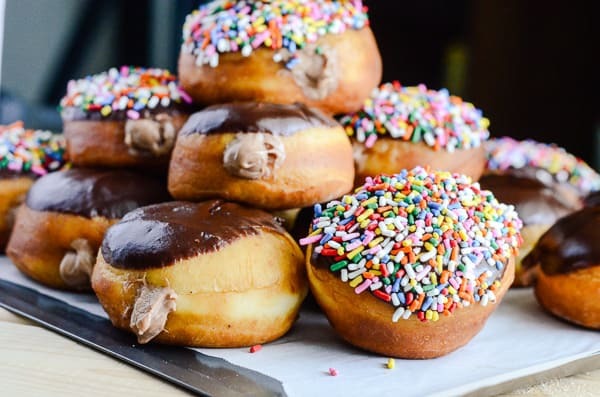 donut, nutelle, cheesecake, sprinkles, how can you not want one or 4 of those haha 🙂 thanks for sharing these yummy treats. You got me with dessert! LOVE THIS!!! I already bookmarked this recipe and cannot wait to try this soon. The donut looks really good. Thanks for the recipe. These donuts (or doughnuts. whatever) basically just blew the tastebuds right off my face! Nutella, Cheesecake AND doughnuts in the same sentence? Gimme some of that! Pinned! Wow! These sounds fantastic and they look gorgeous! Pinning! Wow! 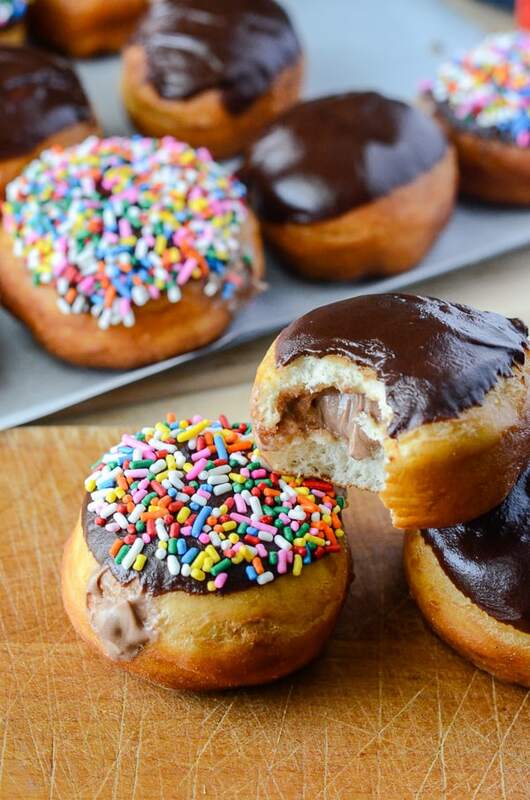 Nutella Cheesecake Donuts! I can eat a dozen of this with my children! Looks so delicious. Thank you so much for sharing this. You had me at nutella! These look amazing! 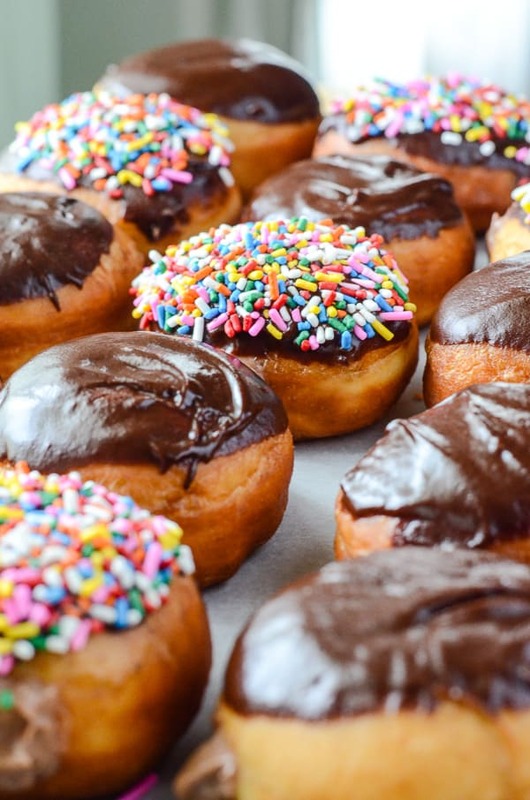 We’ve never tried making donuts at home but we may just have to try these. This looks really good. Thanks for sharing this recipe with us. How delicious! Believe it or not, I have never tried anything with Nutella. I know that my family and I’d be over the moon with this recipe, though! We love donuts. Those look tasty. I don’t have access to a deep fryer, but that is probably a good thing! They look very professional. I love nutella!!! It’s perfect to go as a donut topping with sprinklers. This one looks so delicious. These look and sound so good. Yummy!! My son is graduating on Friday and he loves Nutella so I will have to make these for him for sure. Thanks for sharing. This recipe looks amazing! Those doughnuts look just like Krispy Kreme! 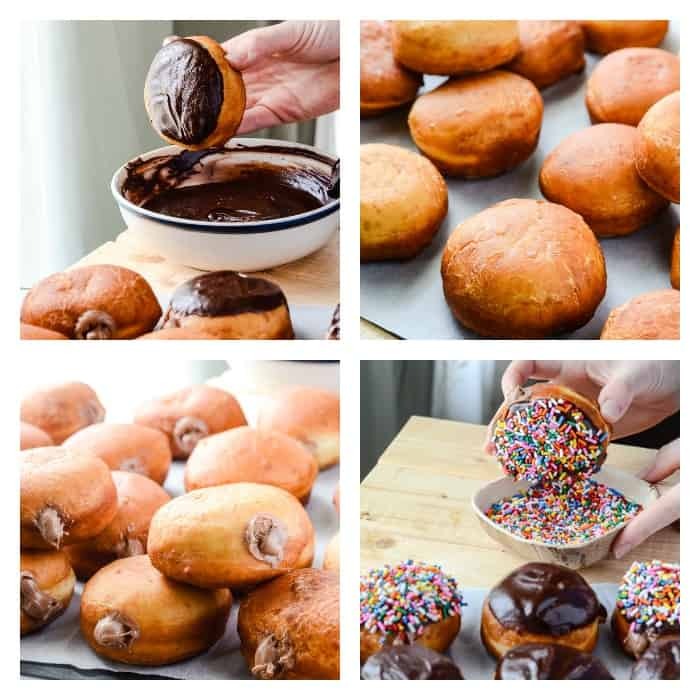 The recipe sounds amazing – I can’t imagine how perfect Nutella and a doughnut together could be. I hope that you guys have a fun time a Disney, the concerts sound awesome and enjoy these treats! Oh my! Can I feature this at my newly created dessert blog? Look so yummy! I love it! I have been doing good with my diet but I think this post is going to change that, lol. These look absolutely drool worthy! Oh so delicious! We are big Nutella fans so I would love to make these. The birthday sprinkles are such a great addition to them too. I pinned this instant! This looks and sounds amazing I love cheesecake, donuts and Nutella so I know this is delish!! !